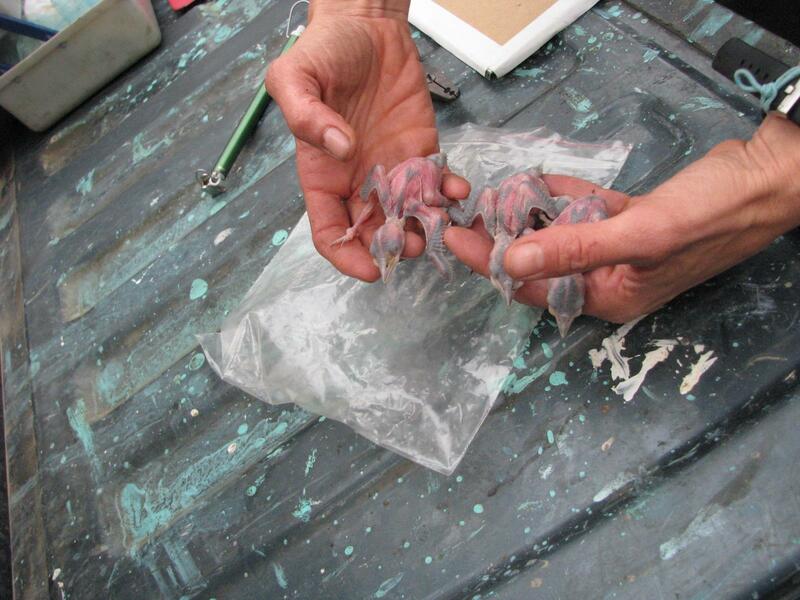 Fort Bragg wildlife biologist Jessie Schillaci holds baby woodpeckers, which the Pentagon and its partners are working to protect on and near the base. 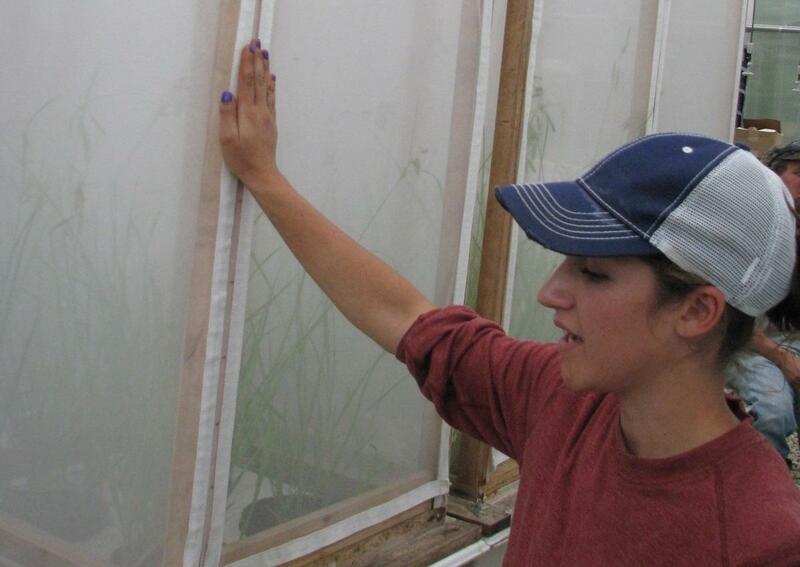 Jenny McCarty, the field crew leader for Fort Bragg's butterfly restoration program, shows off the enclosures where the St. Francis' satyrs are raised. 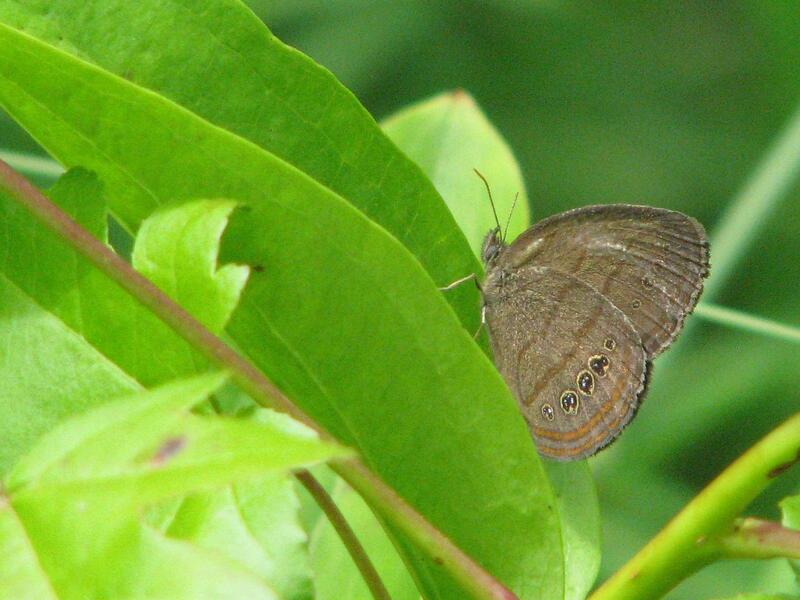 One of the more unusual benefactors of the ecological collaborations is a delicate, thumbnail-sized butterfly called the St. Francis' satyr that now is found only on Fort Bragg. The U.S. military has joined forces with environmental groups to preserve natural habitats. More than 400 threatened and endangered species are benefiting, and so is the Pentagon. Jay Price reports on the military's efforts to protect rare species on and around bases. In the past two decades, the U.S. military has quietly built a huge national conservation network by developing formal -- and once unlikely -- partnerships with environmental groups, universities, local governments, zoos, and even prison systems. They're protecting hundreds of rare species - butterflies in North Carolina, Washington, and Pennsylvania; manatees in Georgia; and dozens of birds and fish around the country. "Believe it or not, military bases also tend to be reservoirs for biodiversity," said Jeff Foster, who manages an Army conservation program at Joint Base Lewis-McChord, south of Seattle. "They aren’t developed for other purposes, like cities and agriculture." Indeed, military bases have the highest density of threatened and endangered species of any federal lands, including national parks. Many bases predate World War II, and some are a century old. Largely undeveloped, the bases serve as something of a biological "time capsule," and are home to entire rare ecosystems. Several rare species, for instance, can be found on Lewis-McChord -- including the streaked horned lark, the Mazama pocket gopher, and the endangered Taylor's Checkerspot butterfly. "It’s really the largest, best piece of habitat that we have, so that’s where all of the species are," said Elspeth Hilton Kim, cooperative conservation program manager for the Center for Natural Lands Management. Decades ago, the discovery of threatened and endangered species on military land sometimes led to conflict. Troops tend to need the same thing that plants and animals need: a thriving natural habitat. To be effective, training needs to be done in realistic landscapes, such as forests, deserts, and beaches. Federal efforts to protect rare wildlife began to hinder training to the extent that Pentagon leaders and some members of Congress worried that military readiness would suffer. 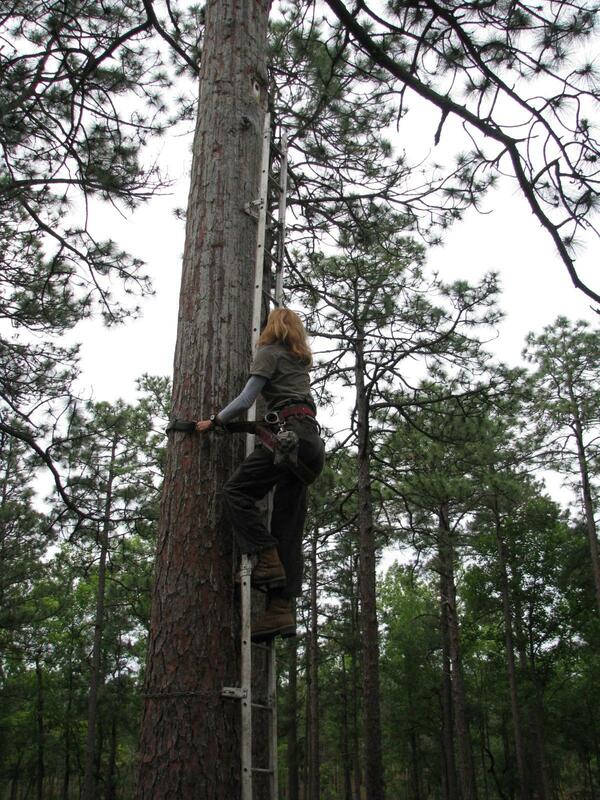 Jessie Schillaci, wildlife biologist for the endangered species branch on Fort Bragg, climbs up to a woodpecker nest to band baby birds for long term tracking. A situation at Fort Bragg, N.C. involving the endangered red-cockaded woodpecker prompted the military to start collaborating with environmental groups. "In 1990, the U.S. Fish and Wildlife Service issued an opinion that required us to protect the woodpeckers," said Monica Stephenson, who as director of public works at Fort Bragg oversees environmental efforts. "So we marked buffers 200 feet around cavity trees, and then that really had an impact on training." But the Army decided that instead of fighting the ruling, it would develop partnerships to help build the woodpecker population back to healthy levels. It began collaborating with the Nature Conservancy, the U.S. Fish and Wildlife Service, and other groups and agencies. "We really focused on what we needed to do to improve the habitat and also to improve training," Stephenson said. Fort Bragg leaders worked with partners to create a buffer zone outside the base where the woodpecker population could expand. The Army helped pay to acquire the land or conservation rights. And intense management of the birds on base worked. The woodpecker population in the area recovered to the point that the training restrictions were lifted. That Fort Bragg collaboration became a national model. The Pentagon office created to help replicate it has now funded 88 partnerships in 30 states, aimed at helping species and habitat both on and around bases. The collaborations are as varied as the bases. At Camp Pendleton in San Diego, the Marine Corps and its partners shelter more than a dozen endangered species from Southern California’s insatiable appetite for coastal development. Partnerships elsewhere are protecting ground water at Fort Huachuca, Arizona and safeguarding the Everglades headwaters at Avon Park Air Force Range in Florida. By building and enhancing buffers of undeveloped land around bases, the military accomplishes more than one goal. The buffers not only allow biologists to build larger local populations of rare species, but they also prevent development from creeping close to bases' borders. That development also can hamper training if a base's new neighbors are bothered by noise and other military activity. "We’re being proactive," Foster said about his collaboration at Joint Base Lewis-McChord. "To think ahead and say 'What can we do now to deal with this problem?' instead of waiting until it becomes a crisis." Lately, the Pentagon has pushed the collaboration model even further with a program aimed at preserving "working lands" such as farms near bases. "Sentinel Landscapes," as it's called, started with partnerships around three bases. This summer, it expanded to three more sites, including by far the largest yet: An effort that includes 33 North Carolina counties around multiple bases, including Fort Bragg and Marine Corps Base Camp Lejeune. 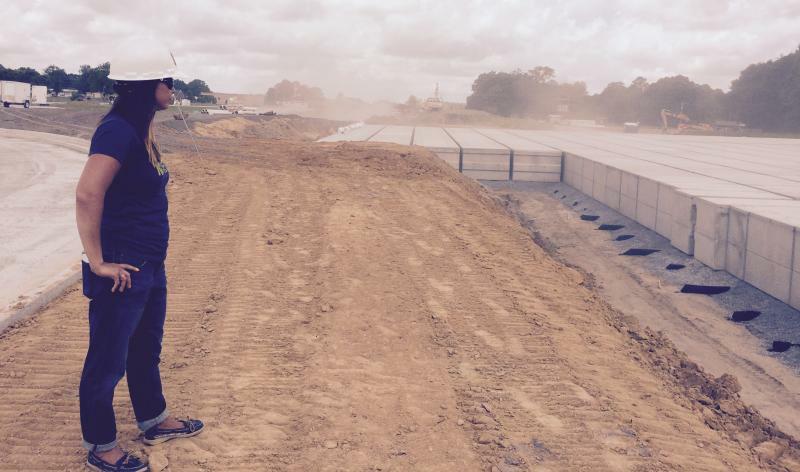 Among other approaches, it's expected to offer voluntary deals to farmers for development rights to land considered important for buffering the bases. "We think it's a win-win for agriculture and natural resources in North Carolina and the military," said North Carolina Agriculture Commissioner Steve Troxler when he announced the new designation at a ceremony near Seymour Johnson Air Force Base. One of the more unusual benefactors of the ecological collaborations is a delicate, thumbnail-sized butterfly called the St. Francis' satyr. Now found only on Fort Bragg, it lives almost entirely on the equivalent of a few city blocks in the impact zones for artillery training. Dr. Nick Haddad catches a St. Francis' satyr on a habitat near the Fort Bragg artillery range. He's working on a project to restore the butterfly's population. There’s a reason it chose that area, said N.C. State University biology professor Nick Haddad: frequent fires. "The artillery sets fires almost annually," he said. "Those fires burn across the forest keeping it open, but they also burn across the wetlands keeping the wetlands open. These butterflies need disturbance for their populations to survive." 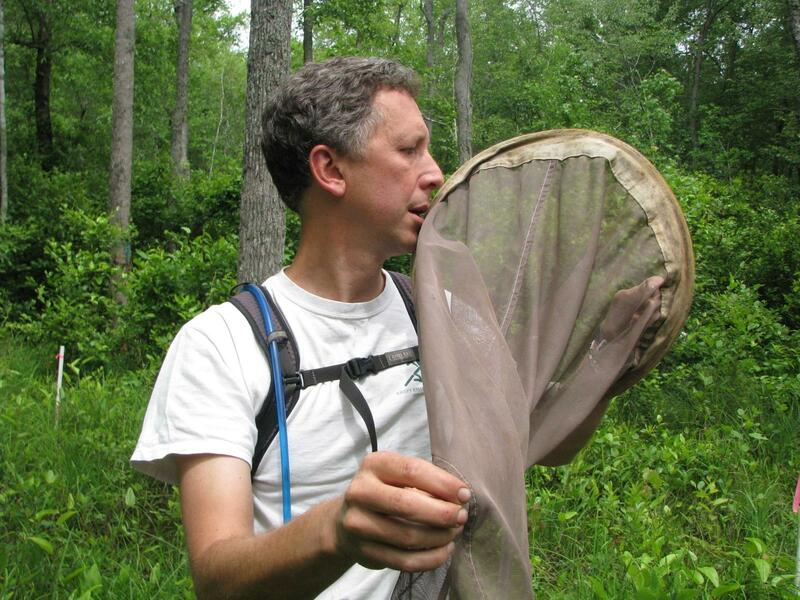 Haddad leads an NCSU team that’s trying to rebuild the butterfly's population. It's funded by the Army and works closely with one of Fort Bragg's staff wildlife biologists, Brian Ball, on an elaborate restoration plan. For now, they're trying to introduce the butterfly to more land on base, but they plan eventually to use sites off of Bragg, too. The part of the artillery range where the butterfly lives is so dangerous that the Army bars almost all outsiders. It's littered with unexploded artillery rounds. Haddad typically is allowed in just a couple of days a year, accompanied by an explosives expert. He and Ball study the terrain the butterfly seems to like best — semi-open wetlands — and use what they learn to try to recreate the conditions on other sites. On those short visits to the range, Haddad also tries to find and catch two to four females. His small team of researchers then uses those to raise more butterflies in an Army-built greenhouse on base. "Once they emerge as caterpillars, they're very, very, very small," said field crew leader Jenny McCarty. "We mark their wings with a Sharpie with an individual number so that we can go and track their movements and their survival rate." "We’ve seen a couple of our marked females mating in the field," McCarty said. "So we know things are working." 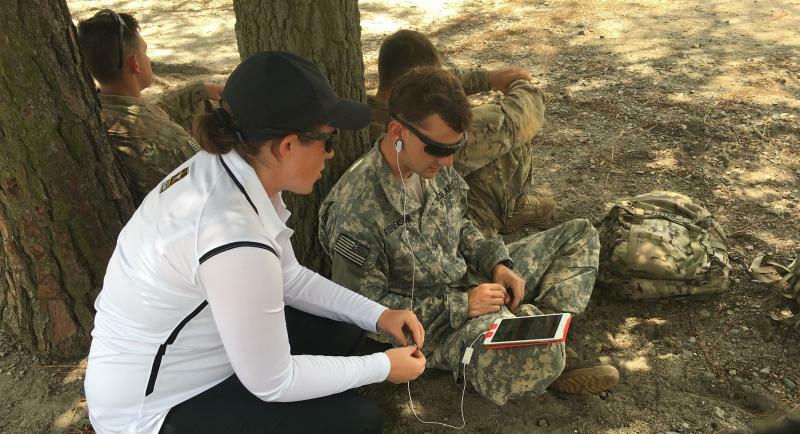 With biofeedback, breath control, and other mindfulness techniques, an Army unit hopes to help turn its paratroopers into more effective fighters. The Veterans Administration and state governments have embarked on the largest expansion of veterans cemeteries since the Civil War.